My late husband claimed he was the Stones’ greatest fan, and had the merchandise to prove it! He traveled across the United States to attend all of their concerts; had t-shirts from every show, and displayed posters on the walls. T-shirts, lighters, bumper stickers and jewelry decorated our house. And of course, the music and the DVDs played constantly! Since 1962, the Rolling Stones have rocked the world of teenagers and senior citizens alike. 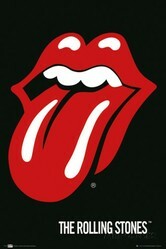 In 1971, with the release of their Sticky Fingers album, the famous "tongue" and lips were introduced as the new logo of the Rolling Stones. Now, some 50 years later, the logo has been updated by artist Shepard Fairey with a much sleeker design. 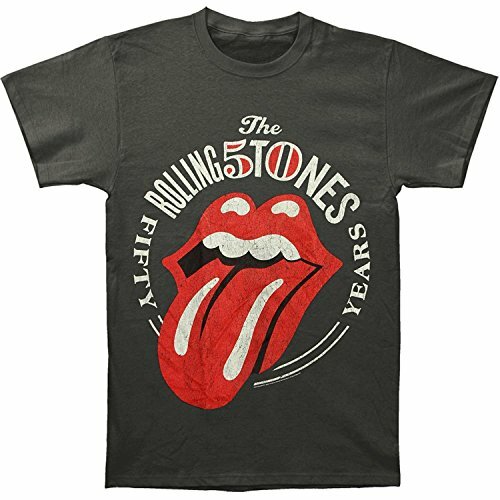 Show your support of the Stones' 50 years of rock 'n' roll by sporting this black t-shirt with the updated tongue logo. It's a classic any fan will enjoy! My husband wore a denim jacket for many years that had a row of patches on each arm. The patches on the right sleeve were for the US Army and 1st Calvary Division, in which he served from 1696-1972. The ones on the left sleeve showed his love for the Rolling Stones. This patch is much like the one he sported on his sleeve. It is officially licensed, and can be either sewn onto your clothing, or ironed on. It is embroidered instead of stamped, so it'll last through many machine washings. Patches can be used to cover holes in your jeans, or used for decoration on just about any piece of clothing; blanket; handbag, or backpack. If you like concert movies, you’ll enjoy the latest Rolling Stones DVD / 3LP set. 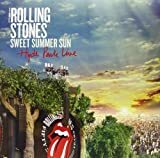 The DVD shows the highlights of the Stones’ return to Hyde Park, while the 3 LPs showcase the best tunes from the last 50 years. “Paint It Black”, “Start Me Up”, “Gimme Shelter” and “Satisfaction” are just a sampling of the music from Sweet Summer Fun. Note: This is the Rolling Stone's latest video, released on November 11, 2013. Do you think you know everything about the Rolling Stones? Test your knowledge with the Rolling Stones edition of Trivial Pursuit. From song lyrics to band members, concert tours to history, this version of Trivial Pursuit is for die-hard Stones fans worldwide. "Ladies and Gentlemen - The Rolling Stones"
“Ladies & Gentlemen” was filmed in Texas in 1972 during the “Exile on Main Street“ Tour, and released 2 years later in New York. Serious Rolling Stones fans consider this to be one of the best Stones’ performances ever filmed. This set contains not only the DVDs of Ladies & Gentlemen, but also "Stones in Exile" and "Some Girls | Live in Texas". 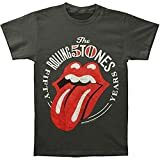 In addition, serious Stones fans will enjoy the Bonus Features of Mick Jagger and Dan Ackroyd's skit on Saturday Night Live, and an interview with Mick Jagger from 2011. Which Rolling Stones gift do you like the best? I own just about every album, CD and DVD that the Rolling Stones have released. In addition, my home library contains many autobiographies, biographies and anthologies pertaining to the Stones and their members. Do you have a favorite Rolling Stones song, book or film? What do you recommend as the best gift for a Rolling Stones fan?